Curious about the Oura Ring and how it can help you achieve better sleep and recovery? Wondering how you can use recovery information for better performance, and how you can use it to optimize your health? 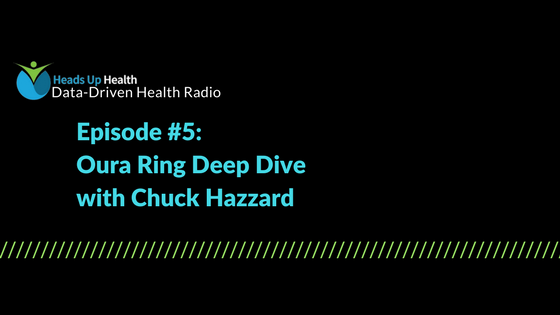 In this podcast episode, Dave Korsunksy sits down with Chuck Hazzard, VP of Sales at Oura, to ‘nerd-out’ over various quantifying metrics, and talk about all things Oura. Chuck, also an endurance runner and technologist, is a total badass in the world of biohacking and data collection. Check out the YouTube video (forthcoming) where Dave and Chuck do some screen-sharing to really deep dive into the data. You can find Chuck here and on Facebook. He blogs at The Human Optimization Project, where he recently wrote about discovering a correlation between his insulin load (using Heads Up’s Analyzer feature) with his resting heart rate, as measured by his Oura ring. This podcast is brought to you by Heads Up Health, a web app designed to help you centrally track all of your vital health data. Instantly synchronize your medical records, connect your favorite health devices and apps like the Oura Ring, and use your data to optimize your health!